Nishimachi, also known as Division Street, in Kobe, Hyogo Prefecture during the 1890s. The photographer pointed his camera towards Meriken Pier, located at the horizon of this photograph (now Meriken Park). 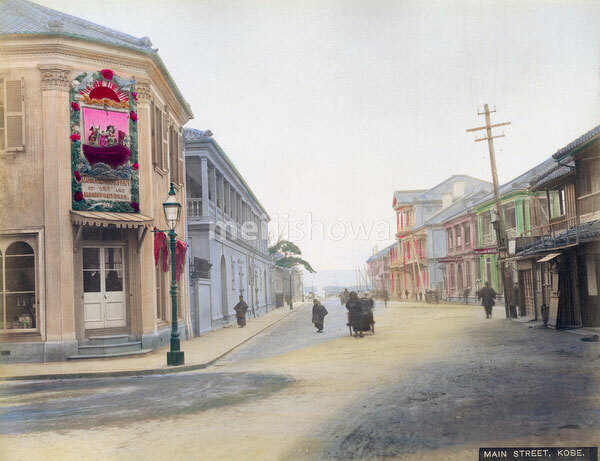 On the left is the shop of Museum Company of Art and Manufactures located on No. 35. The building next to it are the offices of Mourilan, Heimann & Co, agents for shipping and insurance companies. The green building across the street is the Club Hotel. Next door are the offices of Geo. Whymark and Co., an auctioneer, estate agent, surveyor and valuer. Next to Whymark, stands the Grand Hotel.